I started this blog with a post about basic skills: Fieldcraft 101: Tie Twelve Knots . . . My latest contract requires me to refresh the basics so here's an excerpt from Army Field Manual 3-05.70 SURVIVAL (which I helped write in its former edition FM 21-26) - S.L. Field-Expedient Direction (Army FM 3-05.70, pages 18-1 – 18-9). Finding (oneself) in a survival situation, you will be extremely fortunate if you happen to have a map and compass. If you do have these two pieces of equipment, you will most likely be able to move toward help. If you are not proficient in using a map and compass, you must take the steps to gain this skill. 18.1 The earth’s relationship to the sun can help you to determine direction on earth. The sun always rises in the east and sets in the west, but not exactly due east or due west. There is also some seasonal variation. Shadows will move in the opposite direction of the sun. In the Northern Hemisphere, they will move from west to east, and will point north at noon. In the Southern Hemisphere, shadows will indicate south at noon. With practice, you can use shadows to determine both direction and time of day. 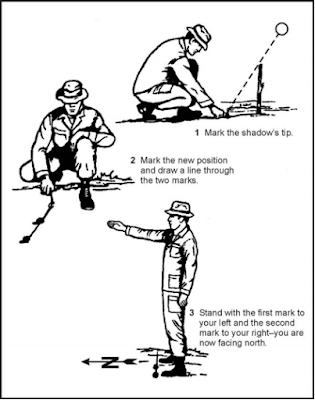 The shadow methods used for direction finding are the shadow-tip and watch methods. • Step 1. Place the stick or branch into the ground at a level spot where it will cast a distinctive shadow. Mark the shadow’s tip with a stone, twig, or other means. This first shadow mark is always west—everywhere on earth. • Step 2. Wait 10 to 15 minutes until the shadow tip moves a few centimeters. Mark the shadow tip’s new position in the same way as the first. This mark will represent East. • Step 3. Draw a straight line through the two marks to obtain an approximate east-west line. • Step 4. Stand with the first mark (west) to your left and the second mark to your right—you are now facing north. This fact is true everywhere on earth. 18-3. An alternate method is more accurate but requires more time. Set up your shadow stick and mark the first shadow in the morning. Use a piece of string to draw a clean arc through this mark and around the stick. At midday, the shadow will shrink and disappear. In the afternoon, it will lengthen again and at the point where it touches the arc, make a second mark. Draw a line through the two marks to get an accurate east-west line (Figure 18-1, page 18-3). 18-4. You can also determine direction using a common or analog watch—one that has hands. The direction will be accurate if you are using true local time, without any changes for daylight savings time. Remember, the further you are from the equator, the more accurate this method will be. If you only have a digital watch, draw a clock face on a circle of paper with the correct time on it and use it to determine your direction at that time. 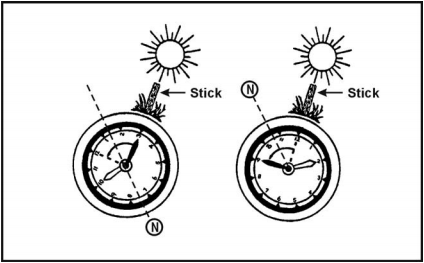 You may also choose to draw a clock face on the ground or lay your watch on the ground for a more accurate reading. 18-7. Another method is called the 24-hour clock method. Take the local military time and divide it by two. Imagine this result to now represent the hour hand. In the Northern Hemisphere, point this resulting hour hand at the sun, and the 12 will point north. For example, it is 1400 hours. Divide 1400 by two and the answer is 700, which will represent the hour. Holding the watch horizontal, point the 7 at the sun and 12 will point north. In the Southern Hemisphere, point the 12 at the sun, and the resulting “hour” from the division will point south. 18-8. Because the moon has no light of its own, we can only see it when it reflects the sun’s light. As it orbits the earth on its 28-day circuit, the shape of the reflected light varies according to its position. We say there is a new moon or no moon when it is on the opposite side of the earth from the sun. Then, as it moves away from the earth’s shadow, it begins to reflect light from its right side and waxes to become a full moon before waning, or losing shape, to appear as a sliver on the left side. You can use this information to identify direction. 18-9. If the moon rises before the sun has set, the illuminated side will be the west. If the moon rises after midnight, the illuminated side will be the east. This obvious discovery provides us with a rough east-west reference during the night. 18-10. Your location in the Northern or Southern Hemisphere determines which constellation you use to determine your north or south direction. Each sky is explained below. 18-11. The main constellations to learn are the Ursa Major, also known as the Big Dipper or the Plow, and Cassiopeia, also known as the Lazy W (Figure 18-3, page 18-6). 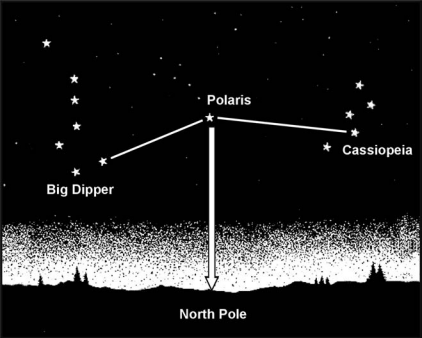 Use them to locate Polaris, also known as the polestar or the North Star. Polaris is considered to remain stationary, as it rotates only 1.08 degrees around the northern celestial pole. The North Star is the last star of the Little Dipper’s handle and can be confused with the Big Dipper. However, the Little Dipper is made up of seven rather dim stars and is not easily seen unless you are far away from any town or city lights. Prevent confusion by attempting to use both the Big Dipper and Cassiopeia together. The Big Dipper and Cassiopeia are generally opposite each other and rotate counterclockwise around Polaris, with Polaris in the center. The Big Dipper is a seven-star constellation in the shape of a dipper. The two stars forming the outer lip of this dipper are the “pointer stars” because they point to the North Star. Mentally draw a line from the outer bottom star to the outer top star of the Big Dipper’s bucket. Extend this line about five times the distance between the pointer stars. You will find the North Star along this line. You may also note that the North Star can always be found at the same approximate vertical angle above the horizon as the northern line of latitude you are located on. For example, if you are at 35 degrees north latitude, Polaris will be easier to find if you scan the sky at 35 degrees off the horizon. This will help to lessen the area of the sky in which to locate the Big Dipper, Cassiopeia, and the North Star. 18-12. Cassiopeia or the Lazy W has five stars that form a shape like a “W.” One side of the “W” appears flattened or “lazy.” The North Star can be found by bisecting the angle formed on the lazy side. Extend this line about five times the distance between the bottom of the “W” and the top. The North Star is located between Cassiopeia and the Ursa Major (Big Dipper). 18-13. After locating the North Star, locate the North Pole or true north by drawing an imaginary line directly to the earth. 18-14. Because there is no single star bright enough to be easily recognized near the south celestial pole, you can use a constellation known as the Southern Cross. You can use it as a signpost to the South (Figure 18-4). The Southern Cross or Crux has five stars. Its four brightest stars form a cross. The two stars that make up the Cross’s long axis are used as a guideline. To determine south, imagine a distance four-and-one-half to five times the distance between these stars and the horizon. The pointer stars to the left of the Southern Cross serve two purposes. First, they provide an additional cue toward south by imagining a line from the stars toward the ground. Second, the pointer stars help accurately identify the true Southern Cross from the False Cross. 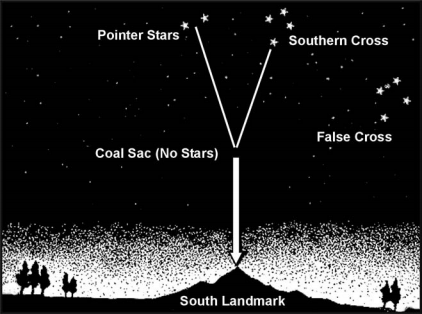 The intersection of the Southern Cross and the two pointer stars is very dark and devoid of stars. This area is called the coal sac. Look down to the horizon from this imaginary point and select a landmark to steer by. In a static survival situation, you can fix this location in daylight if you drive stakes in the ground at night to point the way. 18-15. You can construct improvised compasses using a piece of ferrous metal that can be needleshaped or a flat double-edged razor blade and a piece of thread or long hair from which to suspend it. You can magnetize or polarize the metal by slowly stroking it in one direction on a piece of silk or carefully through your hair using deliberate strokes. You can also polarize metal by stroking it repeatedly at one end with a magnet. Always stroke in one direction only. If you have a battery and some electric wire, you can polarize the metal electrically. The wire should be insulated. If it is not insulated, wrap the metal object in a single, thin strip of paper or a leaf to prevent contact. The battery must be a minimum of 2 volts. Form a coil with the electric wire and touch its ends to the battery’s terminals. Repeatedly insert one end of the metal object in and out of the coil. The needle will become an electromagnet. When suspended from a piece of nonmetallic string, or floated on a small piece of wood, cork or a leaf in water, it will align itself with a north-south line. 18-16. You can construct a more elaborate improvised compass using a sewing needle or thin metallic object, a nonmetallic container (for example, the cut-off bottom of a plastic container or soft drink bottle), and the silver tip from a pen. To construct this compass, take an ordinary sewing needle and break in half. One half will form your direction pointer and the other will act as the pivot point. Push the portion used as the pivot point through the bottom center of your container; this portion should be flush on the bottom and not interfere with the lid. Attach the center of the other portion (the pointer) of the needle on the pen’s silver tip using glue, tree sap, or melted plastic. Magnetize one end of the pointer and rest it on the pivot point. 18-17. The old saying about using moss on a tree to indicate north is not considered accurate because moss grows completely around some trees. Actually, growth is more lush on the side of the tree facing the south in the Northern Hemisphere and vice versa in the southern hemisphere. If there are several felled trees around for comparison, look at the stumps. Growth is more vigorous on the side toward the equator and the tree growth rings will be more widely spaced. On the other hand, the tree growth rings will be closer together on the side toward the poles. 18-18. Wind direction may be helpful in some instances where there are prevailing directions and you know what they are. 18-19. Recognizing the differences between vegetation and moisture patterns on north- and south-facing slopes can aid in determining direction. In the Northern Hemisphere, north-facing slopes receive less sun than south-facing slopes and are therefore cooler and damper. In the summer, north-facing slopes retain patches of snow. In the winter, trees and open areas on southfacing slopes and the southern side of boulders and large rocks are the first to lose their snow. The ground snowpack is also shallower due to the warming effects of the sun. In the Southern Hemisphere, all of these effects will be the opposite. Only around noon. If you do this near sunrise, you'll face much closer to west than north. And near sunset, east rather than north. Keep this in mind if you resort to this method. Nor will it work in most of the Northern Territory, about half of Queensland, and part of Western Australia during December and January (longer if you're farther north, less if you're farther south). Between the equator and the Tropics, around the summer solstice this method will point you south. 18-8. We say there is a new moon or no moon when it is on the opposite side of the earth from the sun. When I was in the Navy, I taught celestial navigation for the USAF Navigator School at Mather AFB. Between that and my degree in physics, I can assure you that this paragraph is precisely WRONG. The new moon happens when the Moon is (not quite exactly) BETWEEN the Earth and the Sun. (If it were exact, it would be a solar eclipse.) The FULL moon happens when the Moon and the Sun are on opposite sides of the Earth. Polaris: "You may also note that the North Star can always be found at the same approximate vertical angle above the horizon as the northern line of latitude you are located on. For example, if you are at 35 degrees north latitude, Polaris will be easier to find if you scan the sky at 35 degrees off the horizon." I would also note that Polaris is the dimmest star normally used in navigation. The only saving grace is that there are no other stars near it that are as bright. You will not be able to see it at all if you are south of about 10 degrees north latitude, because ground haze will obscure it. Modern electronics made celestial nav obsolete, and it's done pretty much the same thing to most other navaids as well. If you know you're heading into the boonies, buy a $100 portable GPS and a solar-powered battery set (such as this one... http://www.amazon.com/GRDE%C2%AE-10000mAh-Shockproof-Emergency-Blackberry/dp/B00SR7EXO2/ref=sr_1_2?s=electronics&ie=UTF8&qid=1442548942&sr=1-2&keywords=solar+battery+charger) Turn it on when you need to know where you are, and then turn it off. If you bought a US model and you're in the Outback or Arabia, it won't tell you the streets, but it WILL give you your latitude and longitude. If you've got a map, you're set. Of course, if you don't have a map and don't know where you're going, you're screwed. At that point, my advice would be to walk until you find a stream and then go downstream. If you're in the desert ... well, it's been nice knowing you! As an American I was astounded how vigorously the Rhodies beat this into everyone's head from SAS to motor pool wrench jockeys..
Used these techniques where even the cooks and the unit morons knew how to read a topographical map and use a compass and methods like this. We actually had guys wander out of nowhere back to us from Mozo and Zambia after their missions went haywire and they had to bomb shell escape and go back on foot.. I laugh now when with LE that most of them don't have a clue as to how to read a topo map or use a compass.